I have designed this page not as a means for me to sell my puppies but rather as a source of information to assist those people, especially in south-western Ontario, who are looking to bring a Golden Retriever into their lives. 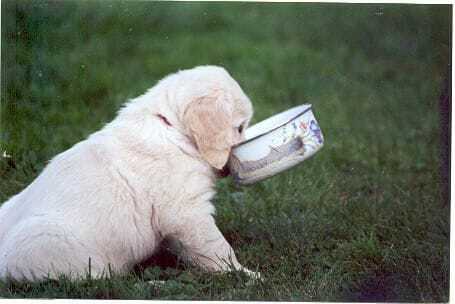 Once you start your search for your golden companion, you will find there are many people who are selling Golden Retriever puppies, sadly the reality is that many of them do not strive to breed quality Golden Retrevers. Hopefully, after reading the information I have compiled for you, in chart form below, you will see the benefits of purchasing your family golden companion from someone who genuinely loves & respects this beautiful breed. Someone who's goal is to try to contribute only the best they can to both the Golden Retriever breed in general and more specifically to the individual Golden Retrievers they produce. As opposed to getting your puppy from someone who obviously does not share these values or who at the very best only pretends to do so. Hopefully you will become an educated & informed consumer, as you would for any major purchase you plan to undertake. So many of the people who call me say "we don't want a show dog...we just want a healthy pet". Don't you DESERVE to increase your chances of purchasing a healthy, happy Golden Retriever puppy! Don't you DESERVE THE BEST! Who will you buy your puppy from? Clean healthy living environment either in kennel or home. Lots of human contact/socialization May or may not be well cared for Poor - kept in barns or outside paddocks all the time (like other livestock) so not really used to human contact Poor - cramped, dirty and unhealthy living environment. Not used to human contact. The popularity of the Golden Retriever breed as a desirable family companion has resulted in an increase in the number of people breeding them. A Golden Retriever is a living, feeling being and as such will become an important part of your life. As a companion that will have such a large impact on your life, please do your research when choosing from whom to purchase your companion. It is safe to say that responsible breeders of Golden Retrievers cannot meet the public's demand for Golden puppies and or adult Goldens. 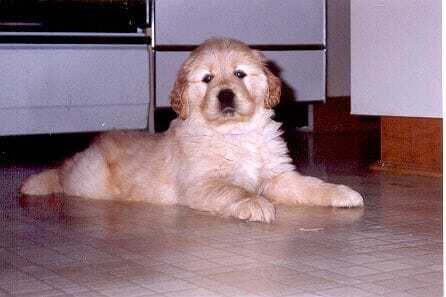 If we could, there would be no need for the presence and proliferation of unreputable producers of Golden Retrievers. This good start begins even before the puppy is born! There is no such thing as a perfectly good lineage, all goldens carry with them the genetic potential for good & bad traits. Pedigree knowledge, knowing what dogs to combine to improve the chances of breeding toward desirable traits and away from undesireable ones, is a vital contributor to your puppy's increased chances of living a healthy life. Rather then simply bringing 2 goldens together with no real knowledge of what they can produce. Of course your puppy's best start possible includes the best emotional, physical, nutritional and veterinary care possible for your puppy's mom, before, during and after her pups are welcomed into the world. proper socializing and stimulation, to help your puppy be ready to go out and meet the big world which awaits! if you want to purchase a golden from a responsible breeder you should be prepared to start looking well in advance of when you wish to welcome the golden into your life. chances are slim to nil that your contacting a responsible breeder, with the request of acquiring a golden in the next couple of months, will be successful. This holds particularly true for the geographic are between London & Windsor, as there is no one producing goldens in that area to whom I would be comfortable refer prospective buyers. I do not say that because I want everyone to come to me, because obviously I cannot meet the demand of all those who live in this area who are looking for a golden. I say that because there is just no one who meets the criteria I have for me to feel comfortable referring people to them. Referral is not something I regard lightly, it is responsibility I take seriously. In most cases the adage "you get what you pay for" is just as true when it comes to purchasing a Golden Retriever. While it may occasionally be true that some people will be asking a large amount of money for a Golden Retriever that is of poor quality, it is very safe to say that you will not be able to purchase a Golden Retriever that is of good quality from a responsible breeder for a small amount money. You can pay a little and increase your chances of having to deal with many costly problems throughout the dog's life with little if any support. Or you can pay more for the puppy and greatly increase your chances of not having to deal with those problems or if you do, you will not have to deal with them alone! Please feel free to contact me with any questions you may have, I am always available to help people who are looking for a well bred Golden Retriever, whether you are getting one from me or not :-) Please allow me a few days to get back to you when you leave a message. You can also contact the GRCC (by going to my links page) where you will receive valuable information not only on purchasing a Golden Retriever but also be provided with a list of breeders who are members and as such abide by the GRCC breeder's code of ethics.